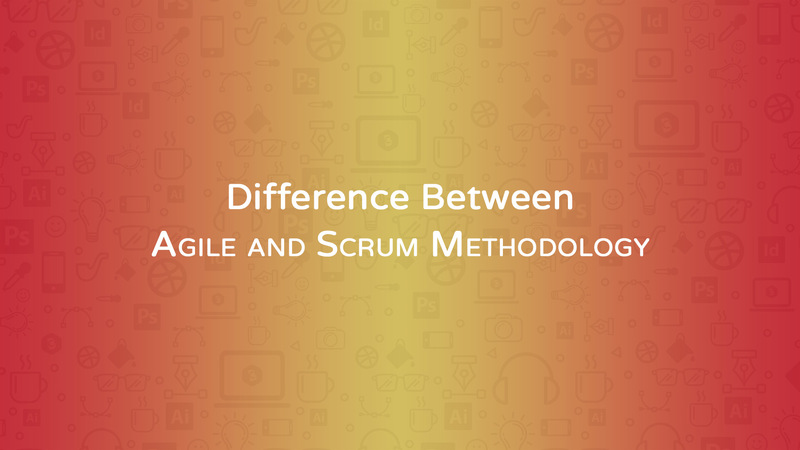 In this article, we will discuss the “Difference Between Agile and Scrum Methodology”. Even though Scrum is a subset of Agile methodology, but there are some differences between them. Agile software represents a group of software development processes including RUP (Rational Unified Process), Scrum, XP (Extreme Programming), and others. But, Scrum is a subset of Agile itself. The Agile methodologies oppose the customary Waterfall methodology in which you need to analyze all necessities, to document and to make a blueprint of the same before starting of software development. Let’s have an overview of the difference between Agile and Scrum. Agile is a project development slant based on iterative and progressive approach. Scrum is one of the parts of agile methodology, in which the user or project manager provides plans. He also reports to the customer in one or two weeks&#39; time apparently. Hence, the timeline oriented customers always prefer to go with Scrum methodology for saving time and money simultaneously. In Agile methodology, the leadership plays an essential role. Scrum encourages a self-building and cross-performer team. People use Agile project development methodology in many suitable environments including a small team with expert project development professionals. But, scrum is specifically implemented in the project where the requirement is quickly changing. The significant benefit of agile is that it’s flexible and reactive to quick changes. Scrum is a more unbending method and not much room is available for repeating changes. In Scrum specifically, collaboration occurs through regular stand up meeting with a preset role assigned to the product owner, scrum master, and team members. Agile needs nos. of up-front development procedures and organizational amendment. At the time of implementation of the Scrum process, you don’t need too many changes. The agile needs repeat delivery to the customer or end user for their true feedback with testing practically. But, the scrum delivers the output to customers for their feedback after each sprint obviously. The project manager takes cares of all the commitment of assignments in the agile methodology. In the scrum, no team leader is available and hence the entire team gets resolved the problems or errors. In an Agile method, the project manager can monitor each step of project development like needs, analysis, development, and design. In the scrum, the teams including project manager can provide a demonstration of the procedure at the end of each sprint to get the exact feedback before proceeding to the next sprint. The project manager organizes regular sprint meeting to review and comment to make the further plan of the project simultaneously. In the scrum, when the team will finish one sprint, they organize a sprint meeting for the next step significantly. In the Agile methodology, you can consider the priority to satisfy the customer by delivering of result oriented software. Scrum also includes Empirical Process Control procedure. Welcome the need for change as per customer feedback and timeline is not a major issue. The agile team also endeavors more effective output according to the functionality of the project. Regular performance throughout the project. Priority on best quality technical excellence and right style design depicts agility significantly. Collaboration: It focuses on collaborative work like awareness, correctness, and articulation. Hence, it provides a higher value to the project with thorough checking or testing at the development and end-user side. Self-organization: This results in improved shared ownership among the members of the team. It is also an innovative and creative project environment which is conducive to growth. Timeline: Scrum considers time strictly and the team output will come on time. Iterative Development: Scrum method helps the team provide the best quality product with iterative development apparently.